Our latest CD to celebrate 70th anniversary of the choir in 2018. 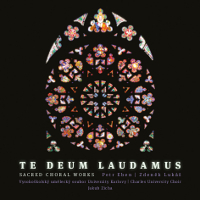 Our latest CD Te Deum laudamus released on the occasion of 70th anniversary of Charles University Choir is available to order via email vus@vus-uk.cz. The CD to celebrate 65th anniversary of the choir in 2013. CD České mše (Czech Masses), released on the occasion of 65th anniversary of Charles University Choir, was recorded in years 2010-2013 and is available to order via email vus@vus-uk.cz. Compilation CD to celebrate 60th anniversary of the choir in 2008. Recorded review of the CD Píseň česká, broadcasted by Czech Radio 3 – Vltava on 6 August 2008 (programme „Rondo“) is available for download here (cca 10 MB, format MP4).Compilation CD Píseň česká (Czech Song) as well as the CD Láska a smrt (Love and Death) and CD Musica spiritualis can be ordered via email vus@vus-uk.cz or bought in the Czech Radio shop on Vinohradská street 12, Prague 2 or in a shop Via Musica at the Old Town Square (Staroměstské náměstí) 14, Prague 1.